Our latest A4 RIPS MFD delivers fast print, scan and copy speeds with a smaller footprint, low TCO and low environmental impact. A fast First Page Out Time (FPOT) of 4.8 secs in black and 5.3 secs in colour from ready mode, print speeds of up to 24ppm in colour and mono (ISO speed), and a fast duplex scan speed of 60ipm help to keep productivity high. An improved durability of 240k pages helps print more for longer. A maximum paper capacity of 1,330 sheets means less time spent refilling. In addition to speeding up printing, the lack of heat needed by our inkjet technology also helps to cut the environmental impact of print by providing a low power solution with fewer supplies. The high ink yield means less waste from supplies, and you can rest assured from a lack of toner dust and ozone gas emissions. It’s compatible with a wide-range of solutions. 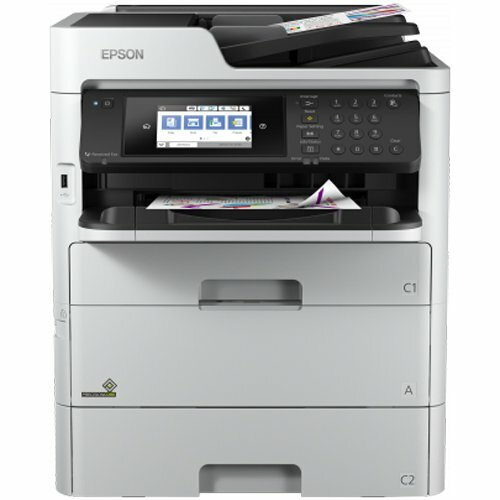 Boost productivity and monitor print usage via server-based Epson Print Admin; control, analyse and manage your printer fleet with Epson Device Admin; or manage advanced push scan functions with Document Capture Pro. Benefit from our partner solutions like Nuance, PaperCut and Y Soft that can be adapted to meet specific business needs.